Content poll #35 will be starting this Thursday and we have a great set of questions. Barrows features, the max cape and many other features are on the table. We want to hear exactly what you have to say about these updates so have a read and let us know what you think! Added a question for the max cape (should it have the stats of the fire cape?). Changed the skill total world requirements to 1250, 1500, 1750 and 2000. Removed the question offering packs of water filled jugs from general stores. Added plant pot packs to the list of packs for Farming supply shops. Expanded on the wild dog charm. Bringing the max cape to Old School is something that has been a longstanding request from many players and as Old School now has over 100 maxed players we feel that the time is right to offer it. The max cape would be available to players with level 99 in all skills (2277 total level). The cape would have the same stats as a trimmed skill cape and would cost 2,277,000 coins to purchase. We will also be adding a second question asking whether the community would like to see the max cape have stats equal to the fire cape. Mod Ghost aims to make the max cape as similar to the original max cape as possible in Old School. The emote of the max cape, however, will be original to Old School. Question: Should a max cape be added to Old School? It would only be purchasable after achieving 99 in all skills and would cost 2,277,000 coins. The max cape would provide the same stats as a trimmed skill cape along with having an impressive emote. Question: If the max cape passes, should it have the same stats as the fire cape? Since the release of Zulrah the price of the boss' signature drops has been slowly declining while the price of Zulrah's scales has been steadily increasing. This has caused some concern in the community and it has been requested that we add an option to convert the signature drops of Zulrah into the consumable scales to create an item sink. If this feature does make it into Old School it will reduce the number of the above items that exist in game and will increase the number of scales. To account for this, we've been quite generous with the number of scales you receive when converting the items. It is worth noting that the whether or not this feature passes of this question will not impact how likely we are to tweak Zulrah's drop table in the future. Question: Should it be possible to convert Zulrah's signature drops into Zulrah's scales by using a chisel on the items? The serpentine visage, serpentine helm and magic fang would be converted to 10,000 scales with the tanzanite fang and toxic blowpipe being converted to 50,000 scales. Old School players who frequent Barrows will know that it is sometimes tricky to work out exactly what you received. To solve this problem, we would like to make the loot from Barrows appear in an interface similar to that of clue scroll rewards. Rather than going straight to your inventory the loot would first appear in a pop-up interface that will show you exactly what came out of the chest. This will make it much easier to see exactly how many runes and bolt racks you received. Question: When looting the Barrows chest, should the loot appear in an interface similar to that of clue scroll rewards? We would also like to offer loot broadcasts when you receive pieces of Barrows equipment and elite clue scrolls from the chest. This would let players near the chest know when someone receives an item of value. 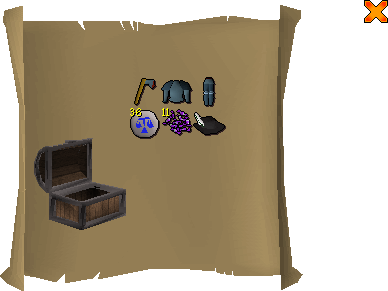 Question: Should receiving a piece of Barrows equipment or an elite clue scroll from the Barrows chest trigger a loot broadcast? Being able to see which Barrows brothers you have killed so far is a small, but useful, quality of life update that we would like to offer. At any point in a Barrows run you would be able to see which brothers you have slain so far to help you choose your path for the remainder of the trip. Question: Should an interface be added to Barrows that allows you to see which brothers you have killed so far? 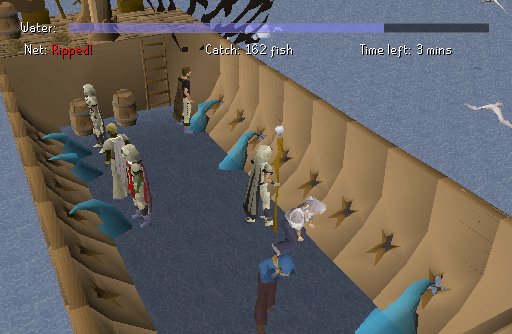 Fishing Trawler is an activity that doesn't see a huge amount of action in Old School. In an effort to bring a few more players to the minigame, we would like to give it a new reward similar to the prospector and lumberjack kit for fishing. In addition to these small bonuses, when the full set is worn an extra 0.5% bonus is given. There will be a slim chance of receiving each piece of the trawler outfit when participating in the fishing trawler activity. Question: Should the trawler outfit be added as a potential reward from the fishing trawler minigame? Each piece will provide a very small amount of bonus experience when fishing, totaling 2.5% when the full set is worn. The wild dogs in the Brimhaven dungeon are a nuisance. Often attacking as you walk by and wasting your precious supplies. We would like to offer a charm to be added to the drop table of hellhounds that would be able to repel these dogs, making sure they do not attack you on your trips to the dungeon. The charm will be dropped by hellhounds empty and would be charged with hellhound fur, also dropped by hellhounds. Every time the charm repels a dog a charge will be consumed. Question: Should hellhounds drop a charm that can repel wild dogs in the Brimhaven dungeon? Question: Should the emotes performed during the drill demon random event (push up, star jump, jog on the spot and sit up) be added as emotes that can be used anywhere? Question: Currently, the toxic blowpipe uses the glassblowing animation as a special attack animation. Should it be given a unique special attack animation? Question: Should the ectophial teleport be given a unique animation? This would be based on the animation used from 2009 onwards. Question: Should clicking the compass turn your camera to face north? Question: Should a toggle be added to your house options that allows you to decide whether teleporting to your house places you inside or outside of the house portal? Question: Should the number of empty buckets the Tool Leprechaun can store be increased from 31 to 255? Question: Should a sell-50 option be added to shops? Question: Should we add packs of plant pots, baskets and sacks in Farming supply shops? Question: Should we make Vet'ion spawn just one hound in each phase, not two, to make the boss slightly easier to kill? Question: Should it be possible to trade an Oomlie wrap for a new bullroarer if yours is lost? Question: Currently, eating half of a full pizza will move the remaining half to the first empty slot in your inventory. Should pizza remain in the same inventory slot when you eat half? Question: Should the process of turning bones into bonemeal be automated? Question: When in a guild, should the skill associated with the guild be displayed in the place of your combat level? For example, in the crafting guild you would see the crafting level of other players when you right click them rather than their combat level. Question: Should the doors in player-owned houses only be closeable by the host? Question: Should Bill Teach have a right-click 'Travel' option after you've completed Cabin Fever? Question: Should the welcome screen be removed when logging in inside the wilderness? Question: Should the number of teleports on the skull sceptre be increased as a reward from the Varrock achievement diary? The number of teleports the sceptre offers will be increased by between 2 and 8 depending on which tier diary you have completed. Question: Should Zilyana drop an item that permanently removes the darkness in the Zamorakian area of Godwars when consumed? Question: Should a shortcut into the Kharazi jungle be added? Question: Should a warning be added to the exit of the fight cave? Question: Should four existing worlds be given a minimum total skill level for entry? The following restrictions have been suggested: 1,250+ total, 1500+ total, 1750+ total and 2000+ total. As always, we want to hear what you have to say about the questions offered on content poll #35. Let us know in the comments below and we will address any feedback before the poll goes live on Thursday. While it may be a good idea to get more scales in game by using chisel on Fangs and Serpentine Visage. I still feel there needs to be an alternative way to get more scales in game and not just directly from Zulrah. I know few people have suggested getting scales from Hunting skill. 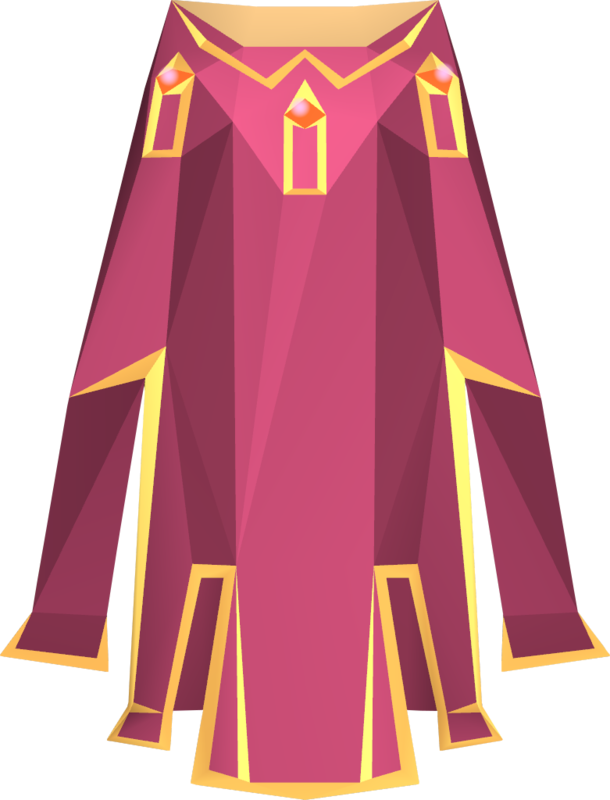 Give the max cape the ability to add 1 cape to it at a time. It will only MATCH current best in slot items. Giving it the same stats as a trimmed skillcape makes it almost useless to use anywhere. FireCape stats please or what my bud Jase said up here ^. EDIT: I think the scales you get from the items are to little. Could you make it possible for the max cape to retrieve arrows the same way ava's accumelator does? Even if it stays with the same stats of a trimmed skillcape i just hope it retrieves arrows so rangers can wear it like melee and magic users. Lots of good updates here that I'll vote yes to, but I'll go in a little bit more detail for some other questions. What I will absolutely vote no to is max capes. These capes simply add more of this very toxic ''no xp waste'' mentality to the game, which I personally see as a big threat to the game. The capes are also not needed, people who have achieved level 99 in each stat already have access to every piece of content in the game basically, that's enough to me. A cape would only be used to show off and add more of the toxic mentality mentioned above. Should they pass, please don't ever make them the best cape in the game, just keep the stats the normal skillcapes have. I like the idea of converting Zulrah's unique items into scales, this should help them to keep a higher value and make the unique items also cheaper to use. I also really like the idea of the fishing trawler outfit, this would give the minigame a much needed boost in activity. Definitely a yes. Total level worlds? I remember when these were added on the maingame and I don't like them at all.